The current spanish legislation to test non-bearing fireproof partitions systems is the UNE EN 1364-1 paragraph 13. The application field of the test results clearly tells us that meeting a couple of test conditions can increase the construction height from 3 m (actual test) to 4 m. For greater heights it tells us that the standard must be tested in a “real scale”. Here there is the main problem, nowadays, none of the 4 accredited laboratories by ENAC for testing fire resistance in Spain, has an oven of a height greater than 4 m for testing non-bearing vertical partitions. Before this inability to conduct a full scale test accredited by ENAC and the real need of doing higher partitions, some fireproof partitions manufacturers (different plates plasterboard, sandwich rockwool panels, silicate panels , etc.) have developed their own systems to make this partitions homologated by themselves. 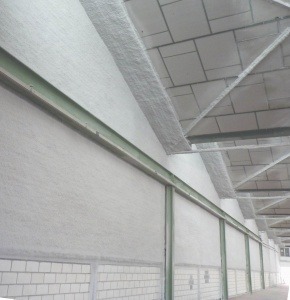 – Wall cladding EI-180 with mortar Tecwool F on corrugated sheet of 0.6mm. – Various non-bearing partitions with Tecbor Panel A. Which allow us not only to withstand the added loads to such partitions higher and avoiding buckling, but also something equally or more important. Withstanding the pressure increasements in case of fire that septum will suffer, since pressure increases in each meter because of the hot gases effect caused by combustion. We would like to influence that when prescribing and evaluate these kinds of solutions that are beyond the scope of strict application of standardized tests, we should not give a big importance to the price and we must rely on companies with extensive experience in fire resistance tests. The consequences in case of fire can be very serious.